With a love for people at the core of its conception, this Pizza franchise serves authentic Neapolitan Pizza as the most delicious excuse to get together. The menu offers something for everyone, it ranges from the classic Margherita Pizza, along with a wide selection of fresh meats, cheeses and vegetables to make your own pizza and salad. Together, the assembly line and bar put on a real show with the two sculptural ovens from Italy, the colorful display of ingredients and each station mastered with pride by pizza makers and barista. The only fast casual pizza that is going to disrupt the existing models, as it not about the pizza, rather the friendships created by spending time at the restaurant. Franchisee friendly organizational philosophy. Their mission statement is “we bring friends together.” Happy franchisees make happy guests. Fun to run. Make money by bringing friends together. While other chains serve pizza, this franchise brings friends together. Guest value proposition: Inexpensive, fun family day or night out with your friends. Franchisees maintain high profile in the community. Franchisees are active in the local chambers of commerce, schools, sports leagues, church etc. Scalable. Easy to run plus Easy to learn means Franchisees’ can grow rapidly into multiple units. Most franchisees have already invested in multiple units. Work-life balance by managing managers. Desirable footprint. Stores range from 3000 - 4500 sq ft). Superior product - Made from high quality ingredients. 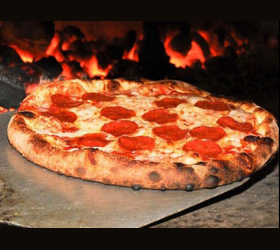 Authentic Neapolitan pizza, a seal that needs to meet rigorous gastronomic rules. Garnish is made of pure ingredients. No students or brokers please. The information contained in this ad does not constitute an offer to sell or award a franchise. You must be a United States or Canadian Citizen with a minimum net worth of at least $500,000. Prime locations. Desirable footprint. Stores range from 3000 - 4500 sq ft). The high end quality of its design combined with the affordability of the menu, including wines, makes it an unrivaled coveted spot to be social. Two sculptural ovens imported from Italy. This franchise is focused on the high end fast casual diner. They have a make-your-own pizza and salad model that is better for customer satisfaction as well as lower cost. This franchise is positioned for very fast growth in a popular food market segment. Business models include Owner-Operator, Executive Model, Passive Ownership Investor. Significant franchise fee discounts are available for 3-5 unit agreements. 4 weeks of Initial Training Program at Global Headquarters. 10 days of opening support. PR and Grand opening support. Ongoing field visits. Ongoing Franchisor Support of 100 people at Global Headquarters.